Refugee Open Wear Interface Design »The war may not be the father of everything, but concerning the development of prosthetic limbs, it may claim parental rights.« (T.N. Tömmel) The number of amputations caused by the conflict in Syria are estimated to be up to 200,000. In the Za'atari Refugee Camp, like in other places of war and crisis, standard and even basic medical care cannot be ensured. What makes a physically handicapped person feel no longer disabled, but enabled or even superabled, regaining self-esteem and confidence? 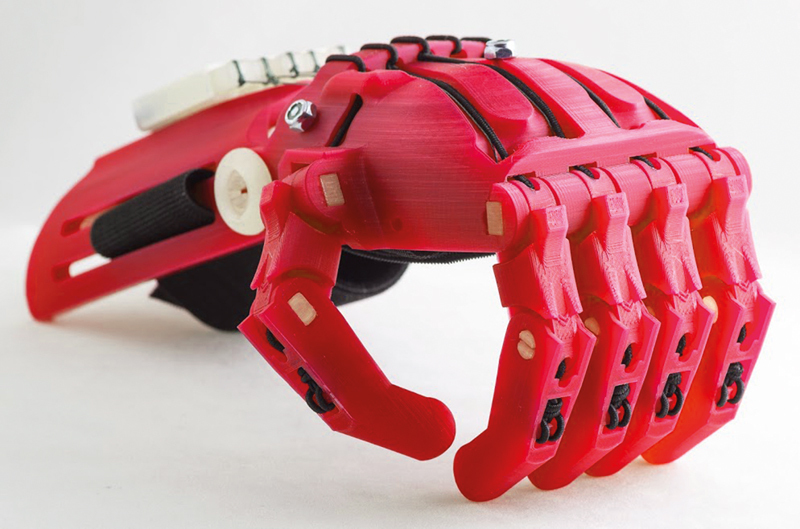 Is it possible that digitally fabricated, 3D-printed hand prostheses may provide a low cost alternative to expensive an inacessable orthopedic devices? »Refugee Open Wear« is a project with the goal to ensure medical first care for young victims in places of crisis. Using Za'atari Refugee Camp as an example, it has been analyzed how disruptive healthcare innovation such as customized 3D-printed hand protheses may contribute to the physical and psychological recovery of young war victims. Research Proposal supervised by Prof. Andreas Muxel, Interface Design.